A throwback to 1950s monster movies, 1990’s Tremors takes us to Perfection, Nevada, a sleepy little town where life seems to dead-end. Tired of this go-nowhere existence, Val McKee (Kevin Bacon) and Earl Basset (Fred Ward) decide to finally depart and find a more hopping location. Before they can do so, though, strange rumblings prevent their exodus. Massive underground creatures menace Perfection and force the residents to get creative if they want to survive this assault. 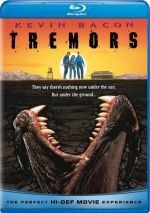 A mix of action and comedy that seemed unlikely to find much of an audience in 1990, Tremors didn’t exactly light up the box office, as it made a tepid $16 million in the US. However, it obtained a cult following on home video, a factor that continues to give it juice nearly 30 years after the original film’s debut. Indeed, spring 2018 brings A Cold Day In Hell, the sixth Tremors movie. The series spawned a short-lived 2003 TV show as well. Of all those sequels, I only saw 2015’s Tremors 5: Bloodlines, a moderately entertaining but generally forgettable film. I maintained positive memories of the original, though, which led me to give this Blu-ray a look. I’m old enough to remember the flick’s debut and how I assumed Tremors would offer cheap cinematic crap. That made it a pleasant surprise, as it used its 1950s “B-movie” origins to create a tale that both paid homage to and mocked its origins in a satisfying manner. Seeing the movie again for the first time in decades, I worried it’d seem stale or less impactful. Happily, those issues don’t become a problem, as Tremors still delivers a lot of fun. One difference comes from my view of the actors, as the presence of a good cast in seemingly cheap “B-movie” fare felt like a surprise in 1990. Granted, Bacon’s appeal had faded somewhat by that time, but he was still a pretty big star, and Ward added class to the proceedings. Then known only as a country singer, the basic sight of Reba McEntire as an actor came as a surprise, and Michael Gross firmly played against type as the gun-loving survivalist Burt. Gross became famous as the bleeding-heart liberal dad on Family Ties, so the decision to cast him as Steven Keaton’s polar opposite felt inspired. All these years later, these choices lack novelty, so I can appraise the actors on their own merits, and they mostly do fine. McEntire provides a weak link, though, as she seems stiff in her cinematic debut. McEntire gets a small enough part that her lack of chops doesn’t harm the movie, and the others compensate. Most walk a fine line between campy comedy and seriousness, and they pull off their parts well. The actors add just the right level of silliness but they don’t veer too far into pure goofiness. The same goes for the tone set by director Ron Underwood. He manages to balance the absurdity of the story and its semi-camp elements with real action, and he pulls off the mix in a lively way. As much as Tremors wants to be a frothy laughfest – and it does bring us amusement – Underwood ensures that the thrills satisfy. The “graboids” present a scary enough threat and the movie pours on action to give us a strong push in that direction. I won’t call Tremors a great film, but it doesn’t aspire to that level of notoriety. It just wants to throw 96 minutes of monster fun our way and let us have a good time – and we do. Tremors appears in an aspect ratio of approximately 1.85:1 on this Blu-ray Disc. This turned into a disappointing presentation. Sharpness became one of many iffy elements. Close-ups showed reasonable clarity but wider shots tended to seem tentative and less than precise. Prominent edge haloes exacerbated this looseness, as did the apparent use of digital noise reduction. The perplexing use of DNR, I should say, as the movie displayed an odd grain structure. At times the image could seem scrubbed, which gave skin tones an unnatural tint, and when grain did appear, it looked off. The movie often displayed obvious grain, but when the camera panned down, the grain remained stuck in place. This wasn’t the first instance of “frozen grain” I’ve seen, but it was one of the more blatant – and distracting – examples. I saw no jagged edges or shimmering, but source defects were a moderate issue. In terms of print flaws, a smattering of specks and blemishes appeared. Tremors featured a fairly lively palette within its arid desert confines. I thought the hues seemed a little overcranked, but compared to the other problems, that was a minor complaint, so the colors usually became one of the image’s better elements. Blacks were pretty dark and deep, while shadows showed reasonable clarity. The softness, odd grain structure and ugly edge haloes turned into the biggest issues here, and these led to a “D+“ grade. I nearly went with a “C-“ but too many ugly scenes turned the image into a mess. At least the movie’s DTS-HD MA 5.1 soundtrack worked better, as it offered a lively affair. While the mix lacked the impact of more modern work, it still delivered a pretty active soundscape. Of course, the movie’s many action scenes fared best, as those used the various channels in a positive manner. I’d be hard-pressed to claim the mix featured actual five-channel movement - Tremors predated the era in which 5.1 became common – but the audio provided good movement and involvement, with fun impact when the “graboids” did their thing. Though a bit dated, audio quality still held up well, with music that appeared fairly peppy and full. Some dialogue showed mild edginess and stiffness, but speech remained intelligible and mostly natural. Effects could also be a little harsh at times, but not to a problematic degree, so most of these presented reasonably accurate material. While not great, low-end added a bit of oomph to the proceedings. I found this to be a track with enough positives to earn a “B”. As we shift to extras, the main attraction comes from The Making of Tremors, a 10-part documentary. It fills a total of 53 minutes, 58 seconds and includes comments from director Ron Underwood, writers Steve Wilson and Brent Maddock, creature effects creators Tom Woodruff Jr. and Alec Gillis, and miniatures designers Dennis and Robert Skotak. “Making” looks at the film’s roots and development, story/character areas, sets and locations, creature design and various effects, cast and performances, photography and editing, and the reshot ending. Created back in 1998, “Making” shows its age via its lack of fluidity, as it plods from one topic to another without a smooth progression. Still, it gives us a pretty good overview of the topics. I wish it came with a broader range of participants and gave us a more dynamic presentation, but at least we learn a lot about the flick. A collection of Outtakes goes for five minutes, seven seconds. Though the title may imply a blooper reel, “Outtakes” actually delivers deleted scenes. We get four of these, including the movie’s “Original Opening”. Two of the other three offer some character moments from the first act, while the last one shows Val as he tries to encourage Mindy to be brave. All are good to see but they remain pretty insubstantial. After this we find a featurette. 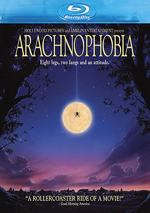 Created in 1990 to promote the film, it fills three minutes, 52 seconds and provides remarks from Underwood and actors Kevin Bacon, Reba McEntire and Michael Gross. The featurette consists mostly of movie clips, and it does nothing more than promote the film. If you skip it, you won’t miss anything. In addition to two trailers, we find three Actors Profiles. These offer short reels for Michael Gross (2:23), Kevin Bacon (2:56) and Reba McIntire (1:56). These follow the same pattern as the featurette, which makes them superficial and forgettable, though McEntire’s enthusiasm about her new gig as an actor boasts some charm. A throwback to monster movies of the 1950s, Tremors brings us a fun adventure. It mixes comedic self-awareness with lively action to become a satisfying experience. The Blu-ray brings us pretty good audio and some decent supplements but picture quality seems severely subpar. While I like the movie itself, I can’t endorse this ugly visual presentation.